Aren't these a pair of stunners? I managed to pick them up for a pittance, along with a handful of vintage Panther comic books, and if I told you what they cost me you'd just scream. Hot off the press and in your store today, well, at least it is if you live in Australia. I've been waiting to hold this little puppy in my hands for months now, and colour me happy because here it is. From the publisher First Salvo comes the first issue in what should be a long line of comic books. Written by Thad Branco and Anthony Cannonier, Dangers Dozen features some of the best artwork to come from Norm Breyfogle in ages. Add to that a back-up story by Mike Baron and drawn by Gabe Eltaeb, well you can see how you can't go wrong with this one. All six issues have been fully written and drawn, so this is one book that'll be coming out on time, every time. Go into your local store and order it, buy it, read it and enjoy it. It's comic books like they used to be - enjoyment over flash. What do James Kemsley, Don Perlin and Norm Breyfogle have in common? More than you might think. I first interviewed Don Perlin in 2003 and during the course of the interview he mentioned he that he wanted to use the interview as an on-line ad for his 2003 Tourettes fund raiser. That was more than fine with me, so off we went and each time I plugged the interview I also plugged the web-site where Don would be doing his auctions. Don emailed me later and told me that it'd be a raging success, and that made me feel fairly good, which proved to be important as it was a time when I was feeling fairly bad. SYDNEY, Australia (AP) - Cartoonist James Kemsley, who penned the Ginger Meggs comic strip for more than 20 years, died after a two-year battle with motor neuron disease, friends said Tuesday. He was 59. 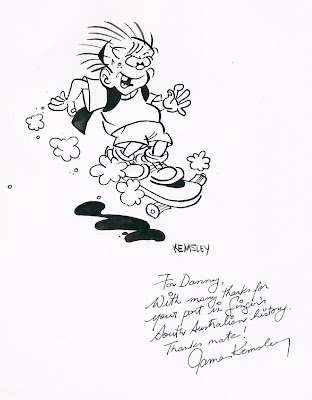 Kemsley, who died at his home in the eastern town of Bowral on Monday, was the fourth cartoonist to draw the comic strip about the precocious red-haired boy named Ginger. He took over production of the comic in 1984, and was widely credited with transforming the Sunday strip to a daily format and expanding readership to more than 120 newspapers around the world, including the United States, Brazil, India and Thailand, among others.